Blog post originally featured on the Living with Cancer blog. Patients diagnosed with cancer at Mayo Clinic now have a new program that can help their care team make informed decisions about their treatment. The Mayo Clinic Biomarker Discovery Program includes a team of specialists that analyzes each patient's tumor for specific biomarkers that help guide treatment recommendations. Biomarkers are molecular substances in the body that can be used to detect or indicate the presence of a disease or condition. For example, with cancer blood or tissue from a patient's tumor can provide valuable information to help the oncologist recommend the best treatment. Ovarian cancer. This project is focusing on identifying biomarkers in patients with cancer that can't be cured by standard chemotherapies. Ovarian cancer tumors can become resistant to chemotherapy for a variety of reasons. Understanding which biomarkers are connected with chemotherapy resistance may uncover new strategies to treat resistant ovarian cancer. In addition, the biomarker program is looking for ways to detect ovarian cancer if it returns as soon as possible. Prostate cancer. This project's goal is to use biomarkers to identify which men have aggressive vs. nonaggressive type prostate cancer. Understanding which patients have aggressive cancer can help identify men who need to undergo surgery and treatment vs. those who do not need to be treated urgently (reducing overtreatment). This project includes genomic sequencing technologies to discover DNA alterations for tumors and cataloging this information in order to study tumor behaviors. Endometrial cancer. This project aims to assess the level of surgery needed for a patient with endometrial cancer. Endometrial cancer can spread to the lymph nodes surrounding the uterus. Normally, an extensive surgery (called a lymphadenectomy) is needed to discover if this is the case. The goal is to identify specific biomarkers that will help surgeons decide which patients are at a high risk of their cancer spreading outside the uterus and those who are at low risk. These biomarkers will help physicians individualize treatment for each woman while saving time, and reducing risks and complications. Lung cancer. Lung cancer is complicated by the fact that many times a patient can have more than one tumor, and each tumor might have a different molecular makeup. For example, one tumor may be adenocarcinoma and another might be made up of squamous cells. This creates a treatment challenge. 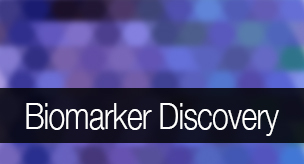 Biomarkers can be identified for each tumor, enabling tailored treatment. Peripheral T-cell lymphoma. The goal for this project is to identify biomarkers that indicate the aggressive nature of the lymphoma. Patients with aggressive peripheral T-cell lymphoma may benefit from more intense treatment strategies, such as stem cell transplantation. Patients with non-aggressive forms could be spared the intense treatment, side effects and risks. As the Biomarker Discovery Program continues to study the genetic characteristics of cancers, scientists will be able to make more precise diagnoses and prescribe the most effective, individualized treatments for each patient.